Driving back from Memphis Sunday evening, fear and worry began to overwhelm me. Every negative thought that I could possibly imagine entered my head. I admit it; the past couple of weeks have been rough, as the reality of my move begins to settle in. But Sunday evening was particularly hard. By the time I returned home, I was more exhausted and emotionally drained as I was before I left on Friday to spend the weekend with my best friend. As I said from the beginning, this blog is real. I won’t sugarcoat my feelings. Although I am confident and at peace about what God is calling me to do, it is still hard; that’s just reality. I have less than six months before I move, and I feel the weight of spending every possible moment with my family and friends and those I love. The time is not long enough; it will never be long enough. I’m beginning to understand why the Bible talks so much about fear. It can mess with your mind so much that it cripples you. Perhaps excitement and fear are two sides of the same coin. Mary was excited and scared when Gabriel showed up with his big announcement. The disciples were excited and scared when they learned that Jesus was alive. Take it down a thousand notches: Joey, my puppy-nephew, was excited and scared when he met his momma (my sister) for the first time. 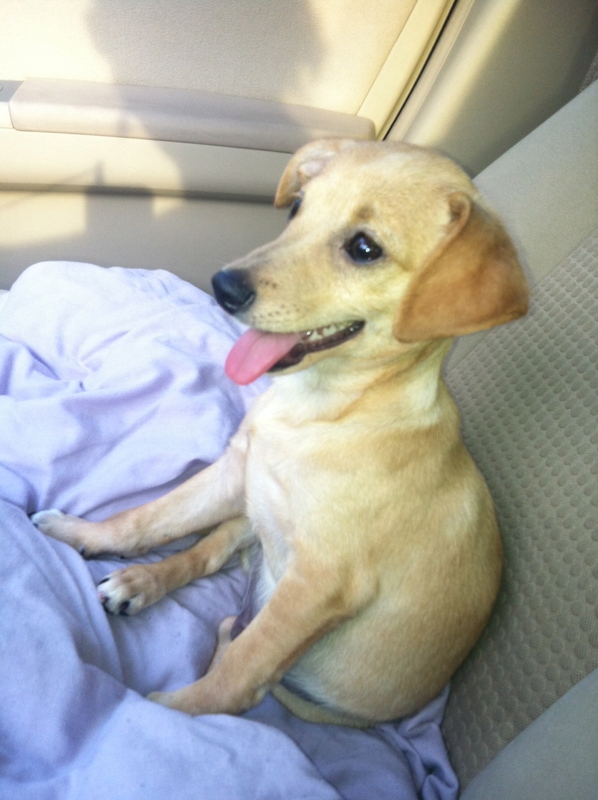 He was so scared that he trembled; but when my sister put him in the car to take him home, he was as happy as a lark. I’m excited and scared about moving to South Africa. On the one hand, it’s exciting to start over: do meaningful work, live in a new city, make new friends, attend a new church, have a new community, live a simplified life. On the other hand, it’s scary: Will I fail at my work? Will people like me? Will I make good friends? Will I be able to overcome the homesickness? I’ll be living on a 1/3 of my current salary. I know it’s a rough time that I’m going through, and it will get better. It’s just a part of the process. The hardest choices in life involve risk. I’m willing to take this risk with God’s help. Every meeting holds the seed of a parting. We are vagabonds of God, blown where Holy Spirit wills, hopefully leaving a little of what we have garnered whilst gathering up the stars. I pray therefore that you will always have the vision to venture, the patience to persevere, the determination to succeed, and the courage to fail. Thanks, Roland, for the thoughtful, wise, and encouraging words. Thank you, Nicole, for sharing your honest feelings. I think it is good that you are embracing your feelings well before you leave, giving you time to process while here. This journey called life has plenty of ups and downs, does it not?! You will not fail. People will love you. Unknown best friends will be waiting there to welcome you with open arms. Known best friends will be waiting here to welcome you back with open arms. You will be homesick while you are there, and you will be homesick for there when you return back here. You will. They will. God will. Nicole-Thanks for your honesty and for your courage. I was drawn by your title today as Fear is a regular and unwelcome companion to me. I’m increasingly grateful for the fearless presence of the Good Shepherd. I’m imagining him now walking with you as a presence so much grander than little Fear. Robin, Robin, Beth, and Sharon, thank you so much! The encouragement is so helpful. I truly feel better. Sharon, thanks for the reminder of Jesus as the Good Shepherd. I need to relax and trust in his love and care like a little lamb. is so much easier than heading in to the unknown. That’s where faith comes in. I can’t wait to hear how happy you are when you start your new life. Just remember, you are never alone. Nicole it will be a pain filled but rewarding journey.